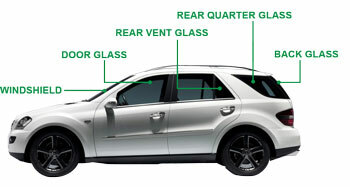 Adkins Glass Company provides in shop and mobile auto glass replacement services for all the glass in your vehicle. We specialize in luxury and exotic cars but are more than qualified to replace any piece of glass in every year, make and model of vehicle. The friendly customer service reps at Adkins Glass can also help you start your insurance claim. 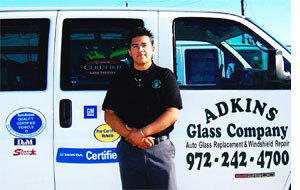 Mobile auto glass service from Adkins glass is available throughout north Dallas including the cities of Carrollton, Denton, Garland, McKinney, Irving and Plano. Click here for a map of our auto glass service area. All auto glass replacement technicians at Adkins Glass are trained extensively to ensure every auto glass or windshield replacement they perform meets our strict quality standards. For an added level of excellence, Adkins Glass uses only premium auto glass replacement parts and each auto glass replacement technician is certified annually in the latest safety practices and guidelines. Adkins Glass has earned a reputation of quality auto glass service throughout the north Dallas area thanks to our unwavering commitment to our customers and constant drive to be the best. Automotive dealers in the north Dallas area have taken notice of our track record, making Adkins Glass the most requested auto glass service shop among north Dallas dealerships. We are so confident that you will be pleased with our service that we back up all auto glass replacements and windshield repairs with a lifetime guarantee. If you ever have a problem with your new auto glass, just bring it back and we will correct the issue immediately and at no charge. Only Premium Parts... Because You Are Worth It! Low cost auto glass replacement parts continue to flood into the auto glass industry and are quickly becoming a popular way for auto glass shops in north Dallas to cut costs and increase profit. The old adage, "you get what you pay for" is true. This lower cost comes tied with a lower quality standard for the glass which results in defects within the glass, variance in dimension, and other issues that should raise safety concerns. Pursuant of our high quality standards, we use only premium auto glass replacement parts for every replacement - from the windshield to the back glass.